NOTE: This dish was created to celebrate the hard work of farming and the harvesting of wonderful produce for us to enjoy. This dish has it all. The meaty ribs surrounded with homegrown cabbage and vegetables. Served with a slice of cornbread, or your favorite hard rolls, and your family will jump for joy. Rinse meat under cool water; pat dry. Liberally sprinkle ribs with garlic salt. Place the olive oil in bottom of a large skillet and brown meat on all sides, about 8 to 10 minutes. Add onions and potatoes and stir-fry together for another 6 to 8 minutes. Sprinkle vegetables with salt and pepper. Transfer meat and vegetables to a large 8-quarat heavy pot. Add beef broth, and stir in beef base or bouillon cubes. Bring to boil. Add green beans and tomatoes. Add the cabbage on top of vegetables to the top of the pot. Add water to barely cover cabbage. 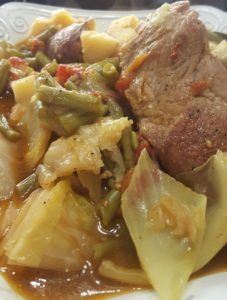 Cover and cook over medium heat for about 1 ½ hours, or until meat is very tender and cabbage is limp. Add salt and pepper as desired. Spoon into large soup bowls and serve with crusty bread for dipping. Serves 8 to 10.